Biogas is an alternative and renewable energy that can be produced by the anaerobic (absence of oxygen) decomposition of organic matter. 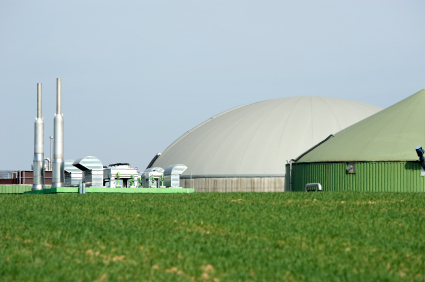 Biogas is typically consisting of 60% of Methane and 40% of CO2. It also contains trace amount of other gases like Nitrogen, Hydrogen and Hydrogen Sulphide. 1. Hydrolysis: This is the first step where particulate materials get converted to soluble compounds suitable for further breakdown in the next step. 2. Fermentation: The second step of degradation is known as fermentation or acidogenesis where the products of hydrolysis such as simple sugars, amino acids, fatty acids etc. break down further and produce final products of fermentation such as H2, CO2 and acetate. 3. Methanogenesis: The third and final step of anaerobic degradation is known as methanogenesis. In this process, one group of microorganism known as aceticlastic methanogens, converts acetate into H2 and CO2. Then a second group of microorganism referred as as Hydrogen-utilizing methanogens combined H2 and CO2 into methane (CH4). The end product of methanogenesis is biogas, a mixture of methane and carbon dioxide. 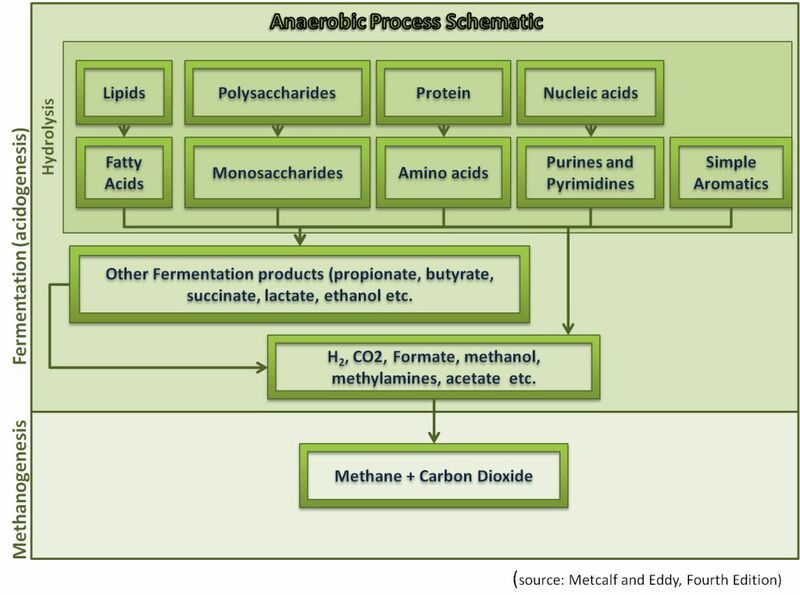 For more detail information refers to the anaerobic process schematic diagram. In Anaerobic Digestion (AD) technology, organic materials are let decomposed and broken down by anaerobic microorganisms by creating optimum environment for them to work. 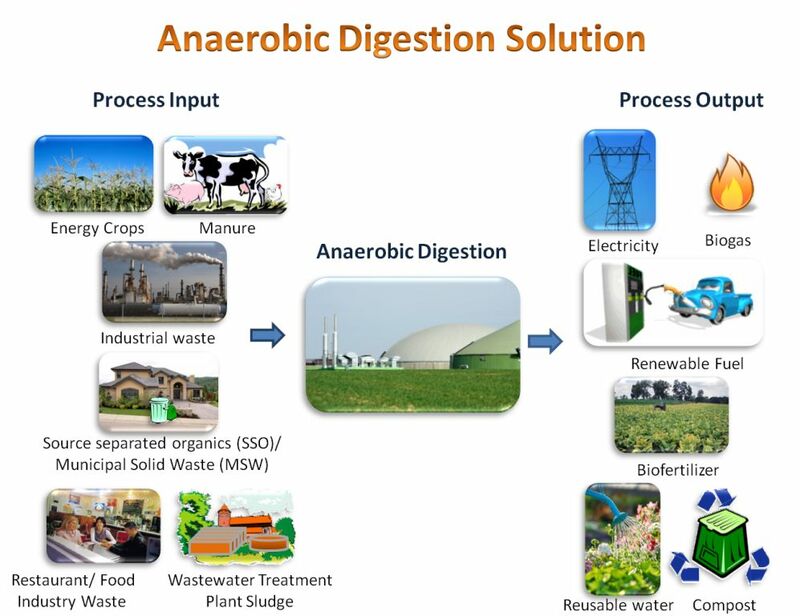 Anaerobic digestion take place generally in an enclosed vessel known as anaerobic digester with or without mixing, and the process can be perform either in Batch, semi-continuous or in continuous mode. This almost 200 years old technology has evolved over the year and exists from its very basic to most advanced form. Most Recent Advances in Anaerobic Digestion Inside One Document! This waste category include separately collected kitchen waste like fruit and vegetable waste, food waste, coffee and tea filters and other organic leftovers. Yard or plant waste include leaves; garden wastes likes flowers, plants, vegetables; branches and tree trimmings, grass clippings etc. The publicly treated wastewater treatment plants produced sewage sludge and that is also a suitable substrate for biogas production. Although due to its limited potential for biogas production it is not treated as a high quality substrate. Solid or liquid manure produced from animal in the farms (cow, pig, chicken etc.) is one of the main substrate for biogas production. Energy crops are plants suitable for producing biogas and other renewable energy and are referred to corn, Sudan grass, maize, millet, white sweet clover etc. Industrial food wastes are mainly come from food and meat production sites like slaughter house waste, whey, potato mash, brewer grains etc. In addition food waste can be collected from restaurants, grocery stores, and other food handling facilities and used as high potential biogas producing substrates. Anaerobic Digestion technology can provide a complete solution to organic waste management. As discussed in the earlier section various types of organic material, waste or substrate can be used as a feed in the anaerobic digestion technology. The end product of the anaerobic digestion is Biogas and digestate (left over of the feed after the anaerobic fermentation and degradation). Biogas generated through the process can be converted to electricity or heating through Combined Heat and Power (CHP) generation unit. Biogas can also be further refined to pipeline-quality gas (comparable to natural gas, which is 97% methane) and used as fuel to run public transportation or waste collection vehicles. Thus producing biogas from local organic waste can provide a stable, local supply of renewable energy. 1. AD can provide an alternative energy source which is promising in the midst of energy scarcity and rising oil price. 2. AD can convert waste to bioenergy, renewable fules and valuable resources thus divert waste from landfill and reduce green house gas emission.